25 Inches / 3.5 Cu. Ft. 29 Inches / 7.0 Cu. Ft. The Copperhead 3 Series pellet smoker is packed with innovative & easy to use features that will have you smoking like a Boss in no time. Smoke low & slow or crank up the heat from 150 to 450-degrees Fahrenheit for up to 18 hours of pellet-fueled cooking time. The double-walled, cold rolled steel cabinet has a hammertone copper finish with a high-heat coating and houses 901 square-inches of cooking space over 4 porcelain-coated, height-adjustable cooking racks. A sturdy latch securely seals the door shut and features a large viewing window with an external heat indicator to keep an eye on things, without sacrificing heat and smoke from breaking the seal. Firing up the Copperhead is hassle-free thanks to the automatic prime function, automatically igniting pellets using a 300-watt igniter and fan-forced draft. Program temperatures with ease using the front-panel control knob and monitor cabin temperature, programmed temperature and readouts for up to two wired meat probes (one meat probe is included) using the digital LED readout. The 35-pound capacity pellet hopper features a side-window for at-a-glance fuel level checking, a hinged access door for quick fill-up and a clean-out door to empty pellets for cleaning or changing flavors. A removable water pan mounted near the base of the cabinet can be filled with your favorite marinades to add more flavor and keep foods fall-off-the-bone tender. A grease tray catches drippings at the bottom of the smoker and slides out for easy cleanup. 2 front swivel casters, 2 rear locking swivel casters and a handle allow for easy placement and portability. 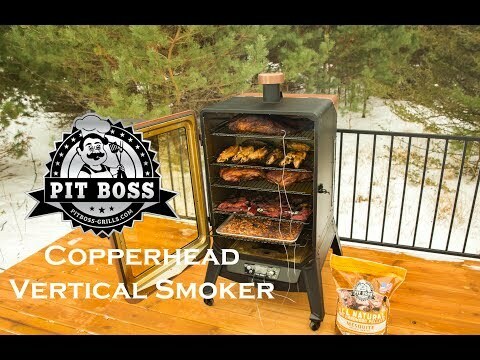 Pit Boss smokers carry a 1-year limited warranty from the date of purchase by the original owner, warranting against defects in workmanship on all parts & electrical components. This unit consistently fails or errors out a couple of hours into cooking. I have now lost 2 pork butts and a brisket, not to mention the pellets that I have burned through. I have attached an image to show how it failed 3 times in a 10hr cool cycle. Pit boss replaced the burner/igniter once, but still has the same issue. How do clean out the ashes from the burner area? whats the dimensions of the rack? Hi, Ed. Each rack is 12 X 14 inches. 901 Sq. Inches 977 Sq. Inches 2408 Sq. Inches 780 Sq"